Besides a half a day at the Convention Center last winter, Providence, the biggest city in the smallest state has eluded me. When planning for the trip, Edgewood Yacht Club in Cranston piqued my interest because of its close, 3-mile proximity to the city and its many attractions, ranging from Italian restaurants to museums and shows. So at 0700 the Karen Marie left East Greenwich and headed farther north. Slowly navigating out the narrow channel and into the bay, we found ourselves completely alone, a stark and almost eerie contrast to our often-overcrowded home water off Newport. Light and shifty winds made sailing difficult. Constant sail trimming and wheel turning had us making a knot and a half of speed, and that was only when Karen and I blew into the sails at same time! After 30 minutes of staring at the same house on the coast, I felt that sufficient time had passed to meet the requirements of “the old college try.” We doused the sails and motored on. Lighthouses and mansions passed just beyond our lifelines, providing hours of entertainment. Before we knew it, the Providence skyline had appeared before our bow . A few unanswered calls from the VHF and cell phone to Edgewood went unanswered, which had us looking out for a plan B but as we approached the mooring field, a very excited launch operator waved us down and greeted us. Lighthouses dot the rocky shores of Narragansett Bay. Taking the dinghy to shore to check in, we immediate got the impression that Edgewood Yacht Club doesn’t get many transient visitors. For example, where I come from, people can often be heard greeting one another by saying: “How’s it going?” “Good, you?” “Good thanks.” And then both parties go on with their day. Greet someone in Edgewood with that same greeting, and you better be prepared to hear exactly how “it” is going. Asking the dockmaster for a couple bags of ice at most marinas is met with a nod towards the ice chest and the quick exchange of $7. The dockmaster here listened, genuinely interested about where we came from, why we decided to stop here, and where we were headed next before relinquishing a bag of the cold stuff. This level of friendliness was a surprise, but a welcome one. It would only take a short trek into town to realize why guests here get looked at like green Martians; the only attraction seemed to be its proximity to the capital city. The temperature at this point had risen to a hot and sticky 90-degrees, which had Karen and myself exploring the air-conditioned aisles of convenience stores instead of hunting down any real points of interest. We decided to leave Providence for another (cooler) day. Maybe in the fall. We opted instead to join my parents, who were in Cranston with us, on a dinghy ride. Loaded down with the four of us, a 55 lb black lab and a cooler filled with drinks had the 8 hp Yamaha working harder than usual to push us towards the city. Puttering past a major shipping port called Waterson Terminal Service was an impressive part of the ride. Mountains of coal and salt towered above us as foreign container ships filled with cars and other goods casted shadows over the Providence River. After exploring the shore of this facility, we decided to turn back to the marina. Now, a good sailor knows to always pay attention to the wind direction and speed. Whoops. We quickly learned that we blissfully had our backs to a building south wind that now hit our raft like a right hook. My parent’s lab, Zoe went from sitting up on the bow, tail wagging at a mile a minute to hiding her head between the bench seat and the portable gas tank. Karen and my mom, acting as unwilling human shields, took the brunt of the salt-spray. 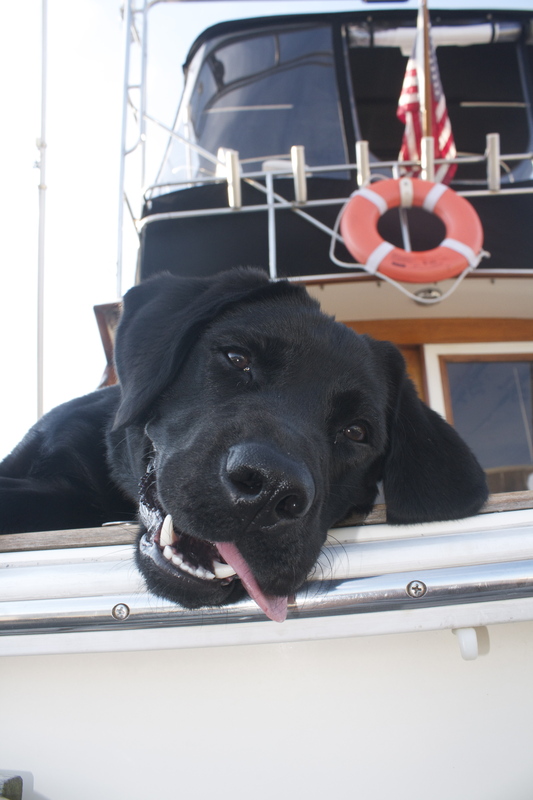 My parent’s usually peppy puppy was glad to return dockside after a rough ride in the dinghy. Some much needed showers, and a few glasses of wine warmed everyone up and we all enjoyed dinner on my parent’s boat. Three games of cards, and a couple hours of smack talk capped off an otherwise pleasant and relaxing evening. If you’re looking for a quiet marina, hidden in the shadows of bustling city, where friendly folks make even the most cynical guests feel right at home, I highly recommend a visit to Edgewood Yacht Club. Be sure to tell them Dan sent you. The clean amenities are almost as welcoming as the boaters at Edgewood Yacht Club. Edgewood is the home of youth, college and adult sailing programs.